A Friend for Your Child? A friend for your kids? 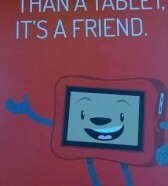 NABI, a touch screen PC for kids is marketed as a “friend” for your kids.